Comment Source:Great! The gods are willing. Our currently active project is ccc-gistemp, a reimplementation of GISTEMP in Python. GISTEMP is a reconstruction of historical temperatures using the instrumental record (records taken and kept at temperature monitoring stations around the world), it’s produced by the NASA Goddard Institute for Space Studies (GISS). It’s a computer program, mostly written in Fortran. One of the outputs of GISTEMP is a graph of the historical temperature anomaly, such as the graphs that you see on the banner of this blog. The “all Python” milestone was achieved with ccc-gistemp release 0.2.0 on 2010-01-11. Naturally we have found (minor) bugs while doing this, but nothing else. Since 0.2.0 we have made major simplifications, chiefly by removing dependencies, and generally processing data internally (by avoiding writing it to intermediate files, which was only necessary on computers that would be considered extremely memory constrained by today’s standards). Work continue on further simplification, clarification, generalisation, and extension. I found this by checking out Graham's sourceforge link. There could be other good stuff there. Comment Source:Here's something I'll add, which Tim may like: [Clear climate code](http://clearclimatecode.org/) >The Clear Climate Code project has the following goals: > 1. To produce clear climate science software; > 2. To encourage the production of clear climate science software; > 3. To increase public confidence in climate science results. >Our currently active project is ccc-gistemp, a reimplementation of GISTEMP in Python. GISTEMP is a reconstruction of historical temperatures using the instrumental record (records taken and kept at temperature monitoring stations around the world), it’s produced by the NASA Goddard Institute for Space Studies (GISS). It’s a computer program, mostly written in Fortran. One of the outputs of GISTEMP is a graph of the historical temperature anomaly, such as the graphs that you see on the banner of this blog. >The “all Python” milestone was achieved with ccc-gistemp release 0.2.0 on 2010-01-11. Naturally we have found (minor) bugs while doing this, but nothing else. Since 0.2.0 we have made major simplifications, chiefly by removing dependencies, and generally processing data internally (by avoiding writing it to intermediate files, which was only necessary on computers that would be considered extremely memory constrained by today’s standards). >Work continue on further simplification, clarification, generalisation, and extension. I found this by checking out Graham's sourceforge link. There could be other good stuff there. Please start new threads (=discussion topics) when creating new articles, even if they're very small articles now. Then when people make changes in an article, there will be a thread for that article. Comment Source:Please start new threads (=discussion topics) when creating new articles, even if they're very small articles now. Then when people make changes in an article, there will be a thread for that article. I just added quite a bit to Climate model, including a graph and the R code to make it. Mostly I am summarising Nathan Urban in TWF 302. Comment Source:I just added quite a bit to [[Climate model]], including a graph and the R code to make it. Mostly I am summarising Nathan Urban in TWF 302. Reto Knutti and Gabriele C. Hegerl, The equilibrium sensitivity of the Earth's temperature to radiation changes, Nature Geoscience 1 (2008), 735-748. I'm going to add a little note to Climate model pointing out this discrepancy, just so nobody reads the Azimuth Project and concludes that CO2 produces 1-2 °C warming before we get this straightened out. Comment Source:Thanks, Graham! But I'm puzzled by your graph of climate sensitivity: <img src = "http://www.azimuthproject.org/azimuth/files/feedback-and-sensitivity.png" alt = ""/> The temperature rise from doubled CO<sub>2</sub> is peaked at a value considerably lower than indicated by Nathan in <a href = "http://math.ucr.edu/home/baez/week302.html">"week302"</a>. 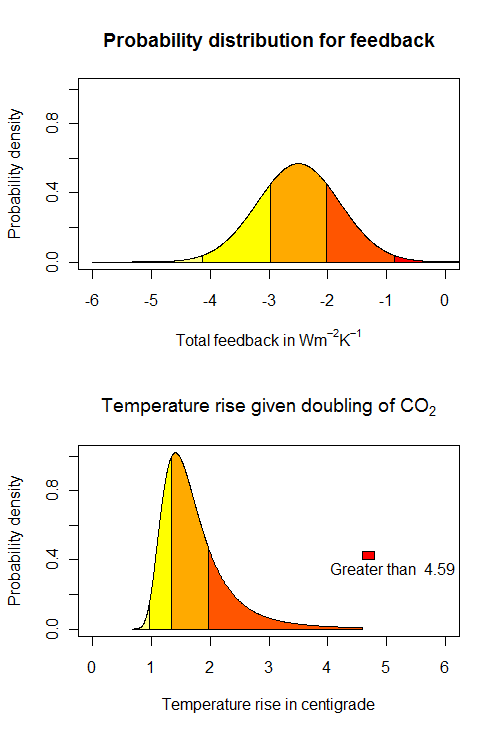 Nathan said: >The IPCC currently estimates a range of 2 to 4.5 &deg;C for the overall climate sensitivity (the warming due to a doubling of CO<sub>2</sub>), compared to the 1.2 &deg;C warming with no feedbacks. See <a href = "http://www.ipcc.ch/pdf/assessment-report/ar4/wg1/ar4-wg1-chapter8.pdf#page=41">Section 8.6</a> of the AR4 WG1 report for model estimates and <a href = "http://www.ipcc.ch/pdf/assessment-report/ar4/wg1/ar4-wg1-chapter9.pdf">Section 9.6</a> for observational estimates. An excellent review article on climate sensitivity is: > * Reto Knutti and Gabriele C. Hegerl, <a href = "http://www.iac.ethz.ch/people/knuttir/papers/knutti08natgeo.pdf">The equilibrium sensitivity of the Earth's temperature to radiation changes</a>, <i><a href = "http://www.iac.ethz.ch/people/knuttir/papers/knutti08natgeo.pdf">Nature Geoscience</a></i> <b>1</b> (2008), 735-748. I'm going to add a little note to [[Climate model]] pointing out this discrepancy, just so nobody reads the Azimuth Project and concludes that CO<sub>2</sub> produces 1-2 &deg;C warming before we get this straightened out. I'm not claiming my numbers are correct, and I can change the graphs. But I don't think there is an uncontroversial truth out there! Also, a very simple model like that is not a sensible basis for serious decisions. I chose my numbers to roughly approximate the predictions in On the generation and interpretation of probabilistic estimates of climate sensitivity, J.D. Annan and J.C. Hargreaves., which combines modern estimates with a prior from paleoclimatic data. It is more optimistic than the IPCC. I've edited the page along these lines. Comment Source:I'm not claiming my numbers are correct, and I can change the graphs. But I don't think there is an uncontroversial truth out there! Also, a very simple model like that is not a sensible basis for serious decisions. I chose my numbers to roughly approximate the predictions in [On the generation and interpretation of probabilistic estimates of climate sensitivity](http://www.jamstec.go.jp/frsgc/research/d5/jdannan/probrevised.pdf), J.D. Annan and J.C. Hargreaves., which combines modern estimates with a prior from paleoclimatic data. It is more optimistic than the IPCC. I've edited the page along these lines. If you look at the individual probability distributions in the Knutti and Hegerl review for observational estimates from historic data (Fig. 3a, red curves), a number of them peak around 2 C, the low end of the IPCC range. Some peak below 2 C. The 2-4.5 C range is an informal combination of many different estimates, including paleoclimate and modeling studies. I don't know which of Annan and Hargreaves's pdfs Graham is attempting to emulate. Note that Annan and Hargreaves don't assume normal distributions on feedback parameters, so it won't be possible to precisely replicate their curves in that way. I'll have to re-read their paper, but I don't think they used a paleo prior in the paper Graham cites. They did in their earlier 2006 paper, which got a pdf with a peak around 3 C.
Comment Source:If you look at the individual probability distributions in the Knutti and Hegerl review for observational estimates from historic data (Fig. 3a, red curves), a number of them peak around 2 C, the low end of the IPCC range. Some peak below 2 C. The 2-4.5 C range is an informal combination of many different estimates, including paleoclimate and modeling studies. I don't know which of Annan and Hargreaves's pdfs Graham is attempting to emulate. Note that Annan and Hargreaves don't assume normal distributions on feedback parameters, so it won't be possible to precisely replicate their curves in that way. I'll have to re-read their paper, but I don't think they used a paleo prior in the paper Graham cites. They did in their earlier 2006 paper, which got a pdf with a peak around 3 C.
I think for the purposes of educating the world we have to be very careful to make it clear if we're doing an example of a model that gives results on the low end of the widely accepted climate sensitivity estimates. Otherwise some idiot will say "look, this graph on the Azimuth Project says the climate sensitivity is probably less than 2 ° C". In fact, even if we do make it very clear, some idiot will probably say that. So it would be great if there were some "standard" or "conventional" probability distribution for climate feedbacks, which we could use here... even though, as Graham points out, it's all rather controversial. Comment Source:Okay. I'm too tired right now to look at the entry now or dig into the paper it's based on... so, just a general watchword, that's probably obvious already: I think for the purposes of educating the world we have to be very careful to make it clear if we're doing an example of a model that gives results on the low end of the widely accepted climate sensitivity estimates. Otherwise some idiot will say "look, this graph on the Azimuth Project says the climate sensitivity is probably less than 2 &deg; C". In fact, even if we _do_ make it very clear, some idiot will probably say that. So it would be great if there were some "standard" or "conventional" probability distribution for climate feedbacks, which we could use here... even though, as Graham points out, it's all rather controversial. I wasn't intending to precisely imitate anything: I was just using Annan and Hargreaves as a guide to plausible values. In any case, more important than what I did, is: what should I do? Comment Source:I wasn't intending to precisely imitate anything: I was just using Annan and Hargreaves as a guide to plausible values. In any case, more important than what I did, is: what should I do? Maybe Nathan can suggest some standard "minimally controversial" probability distribution for climate feedbacks, which you could feed into your program. As long as it's not a horizontal line. I have my own opinions, but as far as "minimally controversial" goes, there aren't really too many synthesis studies try to come up with a "consensus" pdf for climate sensitivity. For demonstration purposes, I'd try to gin up a distribution that looks something like one of the two curves in the bottom panel of Knutti & Hererl's Fig. 3a. Alternatively, you could try to make something that has a lower 10% bound at 1.5 C, a ~2/3 probability of 2-4.5 C, and a peak near 3 C, to reflect the IPCC "expert assessment" range. I wouldn't necessarily pick one of the observational curves out of the top panel of Knutti & Hegerl, but curves that do attempt to incorporate some paleo or modeling prior constraints could work. Comment Source:I have my own opinions, but as far as "minimally controversial" goes, there aren't really too many synthesis studies try to come up with a "consensus" pdf for climate sensitivity. For demonstration purposes, I'd try to gin up a distribution that looks something like one of the two curves in the bottom panel of Knutti & Hererl's Fig. 3a. Alternatively, you could try to make something that has a lower 10% bound at 1.5 C, a ~2/3 probability of 2-4.5 C, and a peak near 3 C, to reflect the IPCC "expert assessment" range. I wouldn't necessarily pick one of the observational curves out of the top panel of Knutti & Hegerl, but curves that do attempt to incorporate some paleo or modeling prior constraints could work. Thanks for guide, Nathan. I've uploaded a new version of the graph with feedback ~ dnorm(mean=-1.5,sd=0.5) which "looks something like one of the two curves in the bottom panel of Knutti & Hererl's Fig. 3a." The new graph is not displaying properly on my browser (you have to click the ? to see it). Comment Source:Thanks for guide, Nathan. I've uploaded a new version of the graph with feedback ~ dnorm(mean=-1.5,sd=0.5) which "looks something like one of the two curves in the bottom panel of Knutti & Hererl's Fig. 3a." The new graph is not displaying properly on my browser (you have to click the ? to see it). Looks like it's in the right ballpark for Knutti and Hegerl's "combined evidence" curves. Might be useful to see the cumulative distribution function too. Comment Source:Looks like it's in the right ballpark for Knutti and Hegerl's "combined evidence" curves. Might be useful to see the cumulative distribution function too. It looks very nice, Graham! I removed that "query box" of mine and moved all the caveats down right below the graph. I too was unable to see the new graph or the new reference when I first looked at it. I used a different syntax to display the graph, and that worked along with your original syntax that had not worked!, so the graph appeared twice. Now I've removed your original syntax, even though it was more elegant. I'm not sure what this is all about... maybe a "cache bug" issue? Comment Source:It looks very nice, Graham! I removed that "query box" of mine and moved all the caveats down right below the graph. I too was unable to see the new graph or the new reference when I first looked at it. I used a different syntax to display the graph, and that worked _along with your original syntax that had not worked!_, so the graph appeared twice. Now I've removed your original syntax, even though it was more elegant. I'm not sure what this is all about... maybe a "cache bug" issue? Here Andrew seems to say that simply the act of editing a page will clear some cache bugs. Comment Source:[Here](http://www.math.ntnu.no/~stacey/Mathforge/Azimuth/comments.php?DiscussionID=191&page=1#Item_2) Andrew seems to say that simply the act of editing a page will clear _some_ cache bugs. I added some of the comments on GCM/RCM from here. Btw, I find the structure of Climate model awkward. Can't we (e.g. I) merge the "Science background" with the Intro? I would also like to suggest to put the classification first, and then expand on the simple 0-dimensional model (so move this section downwards and include linking sentences). Comment Source:I added some of the comments on GCM/RCM from [here](http://www.math.ntnu.no/~stacey/Mathforge/Azimuth/comments.php?DiscussionID=568&Focus=3400#Comment_3400). Btw, I find the structure of [[Climate model]] awkward. Can't we (e.g. I) merge the "Science background" with the Intro? I would also like to suggest to put the classification first, and then expand on the simple 0-dimensional model (so move this section downwards and include linking sentences). Sure, go ahead! That's one of the oldest pages on the wiki and certainly needs a refactoring. Comment Source:Sure, go ahead! That's one of the oldest pages on the wiki and certainly needs a refactoring. Ok, I've made some cosmetic changes. Feedback denotes the reaction of the climate system to the forcing. is this terminology adequate? I think there could in principle be output characteristics which are not involved in feedback? — but maybe in practice all output of climate models is involved in feedback loops? I supposed that feedback in climate science is the same as everywhere else. (Speaking for me personally) I only found forcing new terminology, because I would just say input. On a humorous note, I once read a sentence "the algorithm is adapted to accept real-time data as forcing"
Feedback denotes the reaction of the climate system to the forcing which, in return, may lead to a change in the same or other forcings. I think it should be "Feedback denotes the reaction of the (climate) system to the forcing which, in return, leads to a change in the forcings." Comment Source:I think it should be "Feedback denotes the reaction of the (climate) system to the forcing which, in return, leads to a change in the forcings." That sentence captures the essence of feedbacks, but reads strangely to a climate scientist. We often don't list things like "water vapor" or "surface albedo" as explicit forcings. Comment Source:That sentence captures the essence of feedbacks, but reads strangely to a climate scientist. We often don't list things like "water vapor" or "surface albedo" as explicit forcings. Feedback denotes the reaction of the (climate) system to the forcing which, in return, leads to a change in the forcings and/or system parameters. If not, could you suggest a sentence that is ok for a climate scientist? Comment Source:@ Nathan, does this sound better: > Feedback denotes the reaction of the (climate) system to the forcing which, in return, leads to a change in the forcings *and/or system parameters. * If not, could you suggest a sentence that is ok for a climate scientist? My informal phrasing would be to say it's a reaction of the climate system which tends to amplify or suppress the action of a given forcing. But this is kind of vague. I'm not sure that it's necessary to cater to the historical idiosyncrasies of climate science nomenclature, anyway. Comment Source:My informal phrasing would be to say it's a reaction of the climate system which tends to amplify or suppress the action of a given forcing. But this is kind of vague. I'm not sure that it's necessary to cater to the historical idiosyncrasies of climate science nomenclature, anyway. You probably don't want to know how climate scientists talk about feedback. :) The terminology has been historically garbled. For example, IIRC one early paper reversed the traditional definitions of "feedback" and "gain", leading to later confusion. There is still confusion about "positive feedback", with some thinking it means runaway feedback, and others just a gain greater than unity. And so on. It might be helpful to read the Bates article I cited in "Week 302", and also the Roe review. Comment Source:You probably don't want to know how climate scientists talk about feedback. :) The terminology has been historically garbled. For example, IIRC one early paper reversed the traditional definitions of "feedback" and "gain", leading to later confusion. There is still confusion about "positive feedback", with some thinking it means runaway feedback, and others just a gain greater than unity. And so on. It might be helpful to read the Bates article I cited in "Week 302", and also the Roe review. Thomas Stocker, Introduction to Climate Modelling, in the Springer series Advances in Geophysical and Environmental Mechanics and Mathematics. To my untrained eye in climate science, it looks like a really good book! Comment Source:I added the following entry: A complete introductory textbook on climate modelling: * Thomas Stocker, [Introduction to Climate Modelling](http://www.dvfu.ru/meteo/book/Stocker.pdf), in the Springer series Advances in Geophysical and Environmental Mechanics and Mathematics. To my untrained eye in climate science, it looks like a really good book! Assessments?